Rotary Screw Compressors feature hydraulic inlet valves. Kaeser’s VFD Oil- Free Screw Compressors are offered in CSG-2 SFC, DSG-2 SFC, and FSG-2 SFC models covering flows from 125 to 1788 cfm in 75 to 450 HP rating. Equipped with IE3 motors with PT 100 sensors and fiber-free pulsation dampeners, units come with Sigma Control 2™ controller. Unit’s two-stage compressors come with stainless steel rotors with abrasion-proof coating in the second compression stage. 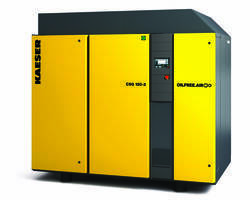 Kaeser Compressors now offers oil-free rotary screw compressors with Sigma Frequency Control (SFC). These new VFD models meet varying flow demands while delivering oil-free air. The CSG-2 SFC, DSG-2 SFC, and FSG-2 SFC models feature the latest in Siemens drive technology to deliver superior part load efficiency and steady pressure in applications with varying air demands. Kaeser’s variable speed, oil-free air compressors are available from 75 to 450 hp and cover flows from 125 to 1788 cfm at 125 psig. They offer large flow control ranges and are up to 9% more efficient than the competition. The core of these SFC model’s top performance is their premium, two-stage compressor airend. The rotors’ special coating can handle temperatures up to 575 °F. This highly abrasion-proof coating will not wear, providing reliable sealing and protection. This means compressed air delivery and energy consumption remain consistent, even after years of operation. Stainless steel rotors in the second compression stage help guarantee compressed air quality and significantly increase service life. Units come standard with Sigma Control 2™. This intelligent controller offers unsurpassed compressor control and monitoring with enhanced communications capabilities for seamless integration into plant control/monitoring systems and the Industrial Internet of Things (IIoT). Additional features include IE3 premium efficiency motors with PT 100 sensors to measure and monitor winding temperatures for maximized motor switching frequency and minimized idling. The hydraulic inlet valve eliminates replacing pneumatic diaphragms, resulting in reduced service costs and downtime. Fiber-free pulsation dampeners keep pressure losses to an absolute minimum, maintain consistent air quality, and prevent compressed air contamination. Built-in heat recovery options give sustainable energy savings and contribute to lowering a plant’s carbon footprint. For more information, visit www.kaesernews.com/oil-free_SFC. For more information or to be connected with your local authorized Kaeser representative, please call (877) 586-2691. About Kaeser: Kaeser is a leader in reliable, energy efficient compressed air equipment and system design. We offer a complete line of superior quality industrial air compressors as well as dryers, filters, SmartPipe™, master controls, and other system accessories. Kaeser also offers blowers, vacuum pumps, and portable gasoline and diesel screw compressors. Our national service network provides installation, rentals, maintenance, repair, and system audits. Kaeser is an ENERGY STAR Partner.